As if NASA’s Voyager mission didn’t have enough firsts in its 36-year journey, what with sending the first spacecraft to Uranus, Neptune and, most recently, interstellar space! 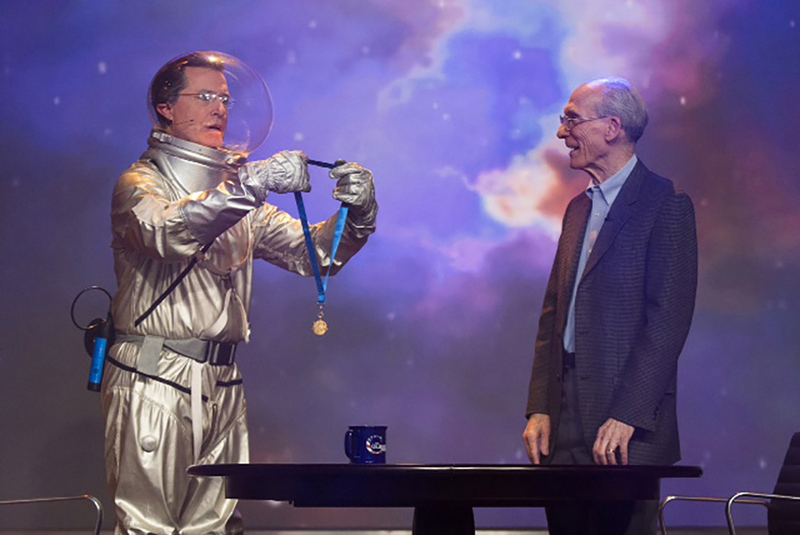 Now, it has another first back here on Earth: on the December 3, 2013 episode of the Colbert Report, host Stephen Colbert floated across the stage in a spacesuit worthy of a 1950s-era sci-fi movie and presented Voyager Project Scientist Ed Stone with a NASA Distinguished Public Service Medal. 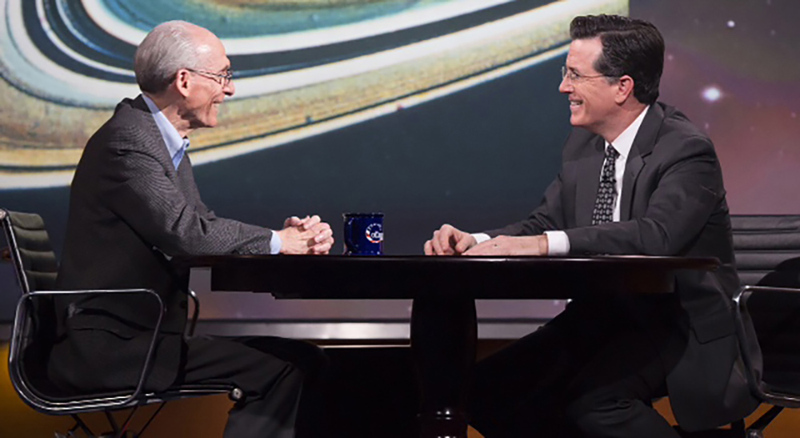 The prestigious award honors Stone for his work as project scientist of the venerable Voyager spacecraft since 1972. Stone grew up in Burlington, Iowa, and attended Burlington Junior College and the University of Chicago. He was inspired to enter the fields of planetary science and space exploration by the launch of Sputnik in 1957, and his career has spanned the space age. Stone has been a member of the Caltech faculty since 1967. In 1972, he became the Voyager project scientist, and he has the distinction of serving as Voyager’s one-and-only project scientist. He has seen the two spacecraft, Voyager 1 and 2, through the planetary encounters of Jupiter, Saturn, Uranus and Neptune and is now eagerly poring through the data coming back from Voyager 1, now exploring interstellar space. While serving as director of JPL from 1991 to 2001, Stone oversaw numerous NASA projects, such as Galileo’s mission around Jupiter, the launch of the Cassini mission to Saturn, a new generation of Earth science satellites and the successful Pathfinder landing on Mars. Stone’s current projects also include serving as vice chair of the board of directors of the Thirty Meter Telescope project, which is preparing to build the most advanced and powerful optical telescope to date.